Macroeconomic Policy Program is implemented within the International Development Program (IDP). This track is a two-year master’s program and designed especially for the Japan-IMF Scholarship Program for Asia (JISPA) scholars. It puts emphasis on macroeconomic policy formulation and public finance, central banking and monetary policy, and financial market policy. 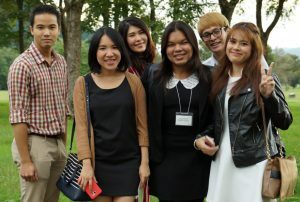 The scholars who complete all requirements are awarded a Master of Arts in Economics. The goal of the program is to equip the scholars with a comprehensive understanding of contemporary macroeconomic issues and to help them contribute to sustainable economic growth and development in Asia and the Pacific. To achieve the goal, the program provides the scholars with the academic and policy-oriented training through the combination of theoretical and practical foundations in the field of economics. Upon arrival at IUJ, we provide JISPA scholars with intensive training program to help them master the basic knowledge and skills which they may not yet have but will be needed to find academic success. This intensive training program gives scholars a chance to connect with their future classmates, and they can learn about the faculty members as the intensive training program is conducted by the professors who will teach them in the formal terms. The first-year curriculum introduces core required courses that provide the scholars with tools, concepts, and theories in economics and related fields. These courses expose the scholars to cutting-edge knowledge in macroeconomics, thus helping them to analyze public policy issues within inclusive and coherent theoretical and empirical frameworks. The scholars start preparations for a master’s thesis toward the end of the first-year. Before the spring term of the first year, all scholars need to decide their research topic for their thesis, and choose an academic supervisor. In addition, the scholars with their supervisor’s guidance have the opportunity to enroll in elective courses that help them explore their research topic. The second-year curriculum consists of elective courses and a master’s thesis writing. Practical and policy-oriented second-year courses strive to expand the theoretical and empirical capabilities developed in the first year. Elective courses are composed of recommended and other elective courses. Specialized courses for those returning to central banks and ministries of finance are also built in specially for JISPA scholars. The scholars identify a unique, macroeconomic related issue to prepare to write a master’s thesis on a research topic of their choice while participating in advanced seminar sessions under supervision of faculty members. Through the process, the scholars have an opportunity to analyze their research topic in depth by integrating theories, methods, concepts and their practical applications that they have acquired in the entire two-year program. Through the 21-month academic challenge, JISPA scholars are able to attend guest speaker presentations on timely and relevant topics given by professionals in the field, some include IUJ alumni now well into their career within their banks and governments. Field trips to key institutions, and well-planned field research for thesis data collection also add to their professional enrichment. In the near future, IUJ hopes to offer additional special programming to our JISPA scholars, including practical professional experiences. Please check back here for updates. IUJ faculty have open door policies allowing IUJ students the unique opportunity to consult on academic matters almost any time. Faculty are more than happy to lend an extra hand. Those requiring additional help to keep up with the rigorous academics are asked to attend tutorial sessions offered by their 2nd year peers hand selected from faculty to give an additional lecture on that week’s topic. If still more help is needed, individual tutors or mentors can also be arranged. IUJ’s rich campus environment provides wonderful professional networking building opportunities along with professional skills development.